Q.Who are your greatest support – who believes in you? Q.Where do you write from? e.g. Kitchen table? Study? Bedroom? Garden shed? When I wrote the book “A Simple Idea to Empower Kids” I was on a baloney in our time-share condo in Fort Lauderdale, Florida. Otherwise I work at my desk in my den at home. Q.Do you write at set times e.g. morning, afternoon, evening, very early morning? I am a shift work who works a rotation of four twelve hour shifts then five days off. Since I sleep on my first day off I work during the next four days. Q.What motivates you to write? When I took the course through the School of Online Business run by Mike Klingler and Robyn Linn July 2013 I did not know what I wanted to do. I simply trusted by taking action and joining their entrepreneurial course I would figure it out. I figured it out by asking my subconscious mind “What would make me want to jump out of bed and be passionate and full of energy about my life?” Within two weeks I started dreaming about writing a children’s book to empower them. Q.What are the biggest distractions to your writing time? Fatigue is the biggest distraction. I work 2 twelve hour days and 2 twelve hour nights and I do not sleep well between my nights. So it takes me a couple of days to adjust. Q.What part of the world do you live in? I live in a small town that takes four minutes to drive through. It is called Inverary is north of Kingston, Ontario, Canada. Kingston is between Montreal and Toronto. Q.Are you from there originally? I am originally from Montreal, Quebec. Q.Have you ever suffered from writers’ block? I have not suffered from writers’ block. When I started the course with the School of Online Business I was more concerned I did not know what I wanted to do. So when I asked my subconscious the question “What would make me want to jump out of bed full of energy?” I expected an answer. Q.How do you overcome it? I would ask my subconscious a question before sleep and nine times out of ten I would have the answer in the morning. If not I would keep asking. Q.Have you taken any writers’ courses and have they been worthwhile? Q.Have you ever belonged to a writers’ group? And what value did you gain from it? Q.Is self-publishing satisfying enough for you or would you prefer to be traditionally published? I get a lot of my guidance from dreams. So originally the dream I had was to contact Hay House Publishers. But since I did not have an agent,my coach at the Academny of Coaching Cognition said to contact Balboa Press Publishers. If the book sells 2000 books in a short period of time Hay House will take notice and may pick up the book. I am not sure what that entails exactly. Q.Have you ever tried to find an agent? Q.What would you expect an agent could do for you that you can’t do for yourself? I think an agent will know people in the industry who may like the book. This is nothing that a little homework on my part would not uncover. Q.Do you think you can make a full-time career being an Indie writer? Q.How long have you been writing? Since I took the course in July 2013. I really like the way it is structured. Q.What drew you to want to write a book? Q.From where did you get the idea for this current story? I asked myself What are three things I can teach kids? What is the most powerful force on Earth? I believe it is the power of love. What do countries go to war over when this is taken away? I believe it is the power of choice. And the third power is the power of belief. Q.How did you go about developing it? Once I knew what I wanted to write about I asked this question. Who is my target audience? I believe it is children around the world but mostly the poorest of the poor. Those children who will never sit in front of a computer or own a book. How do I format the story so they will remember it? In days of old before the general Population carried books tales were told that were repetitious, vivid in the minds of the listeners and ingrained with lessons. This is how the book is formatted.It can be easily memorized. Q.What is your next project? I am currently getting “More of a Simple Idea to Empower Kids” illustrated as the gentleman who did my taxes said sequels do better. So I went home and wrote another book! It elaborates more on the law of attraction. Thank you Kathy for taking time to give us all more insights about you. 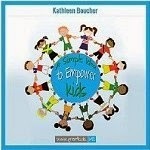 Posted in Interviewing authors and tagged A Simple Idea to Empower Kids, Balboa Press Publishers, Florida., Fort Lauderdale, Hay House Publishers, Inverary, Kathleen Boucher, Kathleen Boucher author, ksbpromotions.com, Mike Klingler, Montreal, Quebec, Robyn Linn, Toronto. Wish you success in all your endeavours. Thank you for your comment. I wish you every success with your book, you will always be welcome to submit your book to http://beezeebooks.com, be delighted to help you promote it. More power to you! I wish you all best in living your life to the full. I am indie author myself with a published book in Amazon Kindle.